The cover of the latest issue of Decision Point en Español. 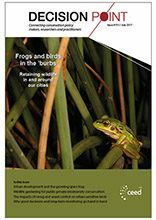 For the third year running the Spanish quarter of CEED has compiled and published a Spanish-language version of Decision Point (you can find the first two issues of Decision Point en Español at http://decision-point.com.au/past-issues/special-issues/#enEspanol). As with issues 1 and 2, the third issue contains a few stories from the English version of Decision Point (in Spanish) but most of its contents are original stories published nowhere else. The line-up for issue 3 includes stories on where conservation research is happening (and where it needs to happen); fish conservation in the tropics; birdwatching and avitourism, whale songs; conservation planning in post-conflict Colombia; plant demographics and COMPADRE; using data from camera traps for conservation planning; fishing rights and conservation on the Chilean coastline; bird conservation and landslide protection; scenarios for ecosystem-service planning; and new technologies for monitoring threatened species. 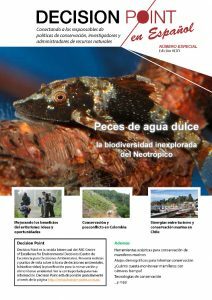 As with previous issues of Decision Point en Español, the new issue is the result of many hours of hard work from a team of Spanish-speaking CEEDites led by Eduardo Gallo Cajiao and Duan Biggs. It is due to be released in July 2017.